Braunschweiger: How can something with such an ugly name taste so fantastic? I have mentioned to you previously (here) about the great group of folks who get together every so often to buy whole animals. When you do this, you get all of the animal including the offal. Yes, say it just like you would say “awful” – an unfortunate coincidence to those of us who love the stuff. The word is derived from the expression “off fall” (hence the pronunciation, you see) which describes that which falls out or off of the animal, on to the floor of the abbatoir when the carcass is hung and sliced up by the butcher, thought of by many as the stuff nobody is willing to eat. People also call these parts “specialty meats.” I guess that is perceived as a little nicer. A rose by any other name? Well, I am a big fan of offal – I cannot tell a lie. I am one of those weirdos who absolutely adores well prepared beef liver (with carmelized onions, especially). I drool over sweetbreads and dream of a well prepared torta de lengua from my favorite taqueria. So, when nobody else wanted the livers from our first Berkshire pig and later from our Red Wattle pig, I happily volunteered to take them home. A pig liver is about 2.5 pounds – not small! But from a pure, organic, well fed, all natural, free and happy pig, you can expect pure and tasty eating. Being a person who makes it a habit never to eat mystery meat, I knew exactly what I wanted to do with that liver. Pig liver, you see, is the main ingredient in braunschweiger (aka liver sausage that is usually smoked or has a smoky flavor). Since I gave up mystery meat (about 8 or 9 years ago after reading Molly Ivins, but that is another story) I had not tasted said sausage. I grew up on the stuff and truly loved it all my life. Who thought about it being made of anything questionable back in the good old days? Come on, there is just nothing to compare to a sandwich made on a couple of slices of good, light rye bread, a generous slathering of mustard or mayo, fresh lettuce and tomato, and some generous slices of braunschweiger. The stuff is spicy, unctuous and just plain delish! Nevermind the fat, cholesterol and (after a few tough years in college) heartburn. This food is well worth eating and, after all, all things in moderation. 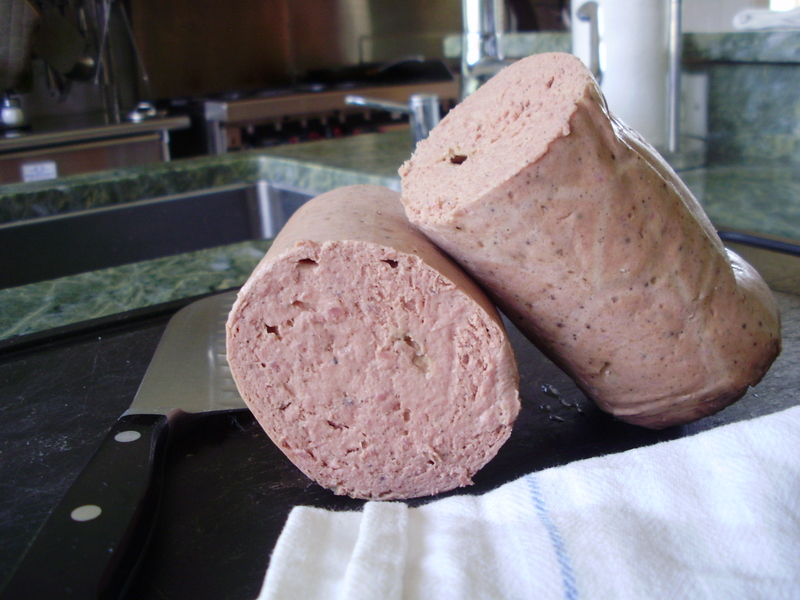 When I saw the recipe for Braunschweiger in several of my charcuterie cookbooks and realized that ordinary humans could make the stuff, I decided to give it a try. The recipe I settled on came from my recently acquired book on garde manger from the Culinary Institute of America. Being who I am, I couldn’t resist a few little, tinsy, weensy adjustments, but the basic technique I learned from this book was essential. Sausage making of any kind requires very meticulous mise en place – gathering and measuring out everything that you need for your recipe and making it all ready before you begin the actual production. Emulsified sausages, such as braunschweiger, hot dogs, bologna, etc. (i.e., those with a fine texture) also require extremely careful adherence to technique. Truthfully, it is not easy and is best done with two people. Unfortunately, all I had was little old me – my darling was off to China on business. Nevertheless, being the pioneer woman that I am, I was bound and determined to get it right on this, my second try. My original effort (with the liver from the earlier pig) had resulted in a product that I was only willing to serve to Sadie (my wonderful and now departed furry little, 7 pound companion). It tasted fine but the consistency was just terrible. This is because the emulsion “broke” meaning that the fat cells did not get bound in the protein, resulting in a grainy product with a mouthfeel that was just plain wrong. Well, all of my concentration and attention to detail this time paid off. Truthfully, I have never tasted braunschweiger so perfect in consistency and flavor. I am convinced that two main things are essential. First is to keep everything, including bowls and all tools as cold as possible while you are working. Second is to religiously follow the proper order of operations: cut up your meats and fat into one inch pieces, including liver, well smoked slab bacon, and pork shoulder. Put the liver and pork mixture and the fat on separate cookie sheets (parchment lining helps). The pork and liver combination is first tossed well with the salt, tinted curing mix (instacure #1) and sugar, prior to being set in the freezer to become slightly “crunchy.” The bacon is also put in the freezer. When just barely frozen, all of these things are put through the grinder using the 3-4 mm disk. The minute it comes from the grinder, the meats are put back into the freezer on the cookie sheet to become crunchy again. The bacon is put through the finer disk a second time, and again, put back in the freezer. Once everything is good and cold again, the other spices (white pepper, nutmeg, ground cloves, allspice, marjoram, mustard and thyme, rubbed sage) are sprinkled over the ground meats. This is placed in a food processor with some crushed ice and emulsified. My food processor is on the smaller side so I had to do it in two equal batches, keeping the unused portion of the meat and fat in the freezer until the moment it was ready to go in the processor bowl. Every 30-60 seconds you take the temperature of the mixture while processing. When the temp gets down to 32F, you add the bacon, emulsifying until the temp rises to about 42-45 F. It is pretty amazing to see the gloppy mess that results but you can see it working correctly right before your eyes. By the time the emulsion was ready to be stuffed into the casings it was the consistency of very, very gooey dough. I wish I had remembered to take a photo for you because it is a little tough to describe. I used large collagen casings which I am able to purchase locally instead of beef middles which are very expensive and only available on the internet. After all, you just peel off the casing anyway and it does not make any taste difference. The next step, which can be eliminated, is to smoke the sausage for about 2 hours at 175F. I chose to skip this step because it was raining like a mother and my smoker is not supposed to get wet (due to its digital circuitry). My bacon was very, very smoky anyway and this flavor seriously comes through in the end product. So skipping this step did not make much difference in my opinion. For the final step I was instructed to poach the sausage in a water bath at 165F until the braunschweiger reaches an internal temperature of 150-160F. But how? How do I control a water bath at that temperature? Sure, I can turn the burner way, way down but even still, 165F is far less than even a bare simmer. Restaurant kitchens have flat tops on which they can accomplish this task fairly well (this is where they often keep the stock and other hot liquids at the ready). Commercial kitchens have way hi-tech equipment for this, not to mention immersion circulators for controlling the temperature in water baths. Wait…. DID I HEAR SOMEONE SAY SOUS VIDE SUPREME????? What a perfect opportunity for the use of my trusty water oven! I heated her up to 165F/74C. I took the stuffed pieces and placed them in zip-lock bags. It is fine to use these in the SVS and, because I would need to take the temp of the sausage during the cooking process, this was the most practical thing to do in this application. When you use this kind of bag, you leave it open while you lower it into the water. The pressure of the water pushes the air out of the bag and just before the bag is fully immersed, you zip it up. When the internal temp of the sausage reaches 66C (definitely well done meat) it is ready to come out and be plunged into an ice bath to stop the cooking. This also serves to help avoid the multiplication of bad microbial spores which could cause spoilage or illness. When the temp is reduced to below 17C/60F in the ice bath, it can go into the fridge where it will keep for at least two weeks. 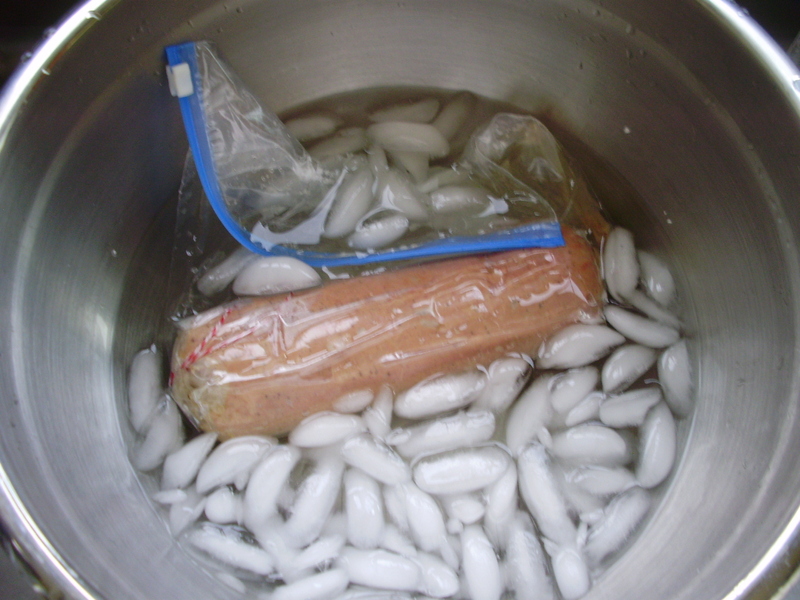 Also, you can easily freeze it for a very long time, due to the generous fat content. 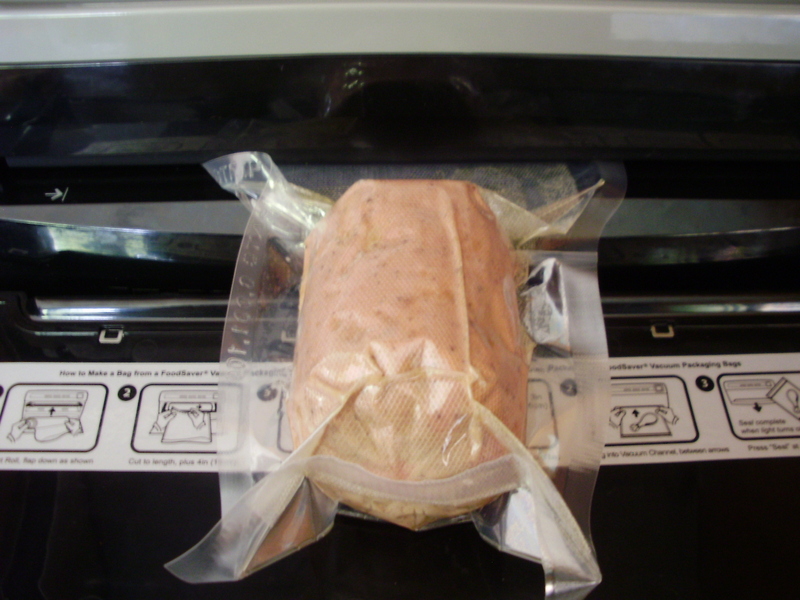 I vac packed it with the Food Saver before freezing, which also goes a long way toward keeping things for a long time in the freezer. Well, as I have said, the finished product was better than I any version of braunschweiger I ever recall eating. I am thrilled that I get to enjoy this delicacy for many months to come – I cut and packaged it in small portions to ensure our long-term enjoyment. It was a lot of work but worth it and I learned tons. Next up: Come back soon for the pork belly I promised you!